beyond their reasoning from other dimensions to war and personal strife. It is titled ‘The Triumph of the Genius of Destruction'. Many feel that there is a multidimensional cause behind the sinister agendas afflicting the world (such as the New World Order). But it is possible not just to sense, but to actually know and uncover its root through firsthand experience. And, unless the root is uncovered, its octopus like tentacles will continue to regrow and find new ways to influence the world, even when several have been cut off. While research alone gets someone so far, ultimately this is an esoteric matter as those at the "center of the spider's web" are multidimensional entities who have awakened in darkness and have been working on this agenda since ancient times. 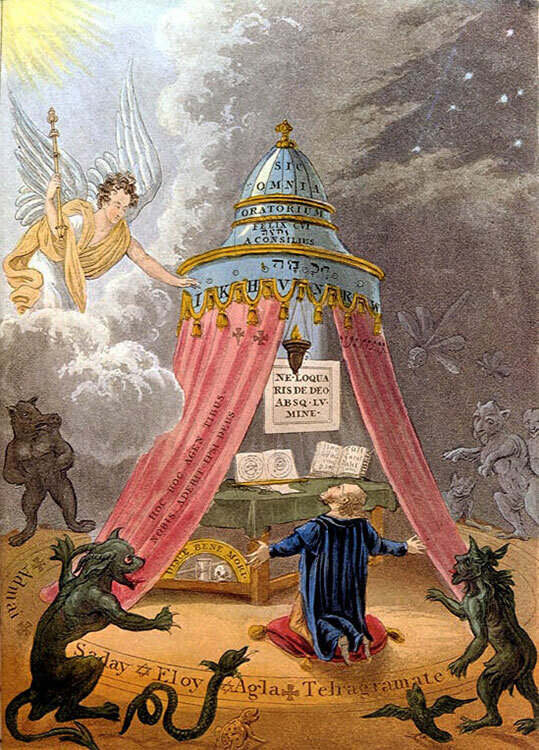 They influence world events through a specific dark occult society whose members have also awakened in darkness and thus are able to communicate with them and access the intelligence of evil. These entities work beyond the realm of ordinary perception, and thus are discovered only by those who can meet and uncover them in these dimensions beyond the body. Many people have encountered these sinister entities since ancient times, and today they are appearing in the ever increasing numbers of near-death experiences, and likewise in other forms of out-of-body experiences including nightmares - revealing who and what these entities are and how they work. Ancient people have been writing about demonic entities since recorded history. through dreams and out-of-body experiences. Many of these ancient people had esoteric practitioners who were able to discover information about these entities and realms beyond the body by using techniques to leave and travel out of the body (called out-of-body experiences), just as can be done today. What they discovered became the basis of many of their sacred texts. They understood the importance of awakening into other dimensions, as it is part of consciousness waking up and seeing beyond the limits of ordinary perception, and used it to uncover information about these entities that influence us beyond our knowledge and sight. Whilst religious texts have been looked at by some as mere tales, the ever increasing number of near-death experiences (NDEs) are now confirming the reality behind many ancient symbols and writings. A Gallup poll has reported that around 8 million Americans claim to have had a near-death experience. Whilst accounts of near-death experiences in which people "go into the light" and experience heavenly and angelic beings and places are well known, perhaps lesser known and admitted to are the NDEs in which people have encountered sinister entities and experienced hellish regions, and there are many of these too. Although there are some cultural differences in interpretation, the accounts are similar irrespective of belief, whether they were an atheist, Christian priest, Muslim, Buddhist or otherwise. to come out of her body, which would likely give her a nightmare. These entities are also extremely prevalent in out-of-body experiences (OBEs). 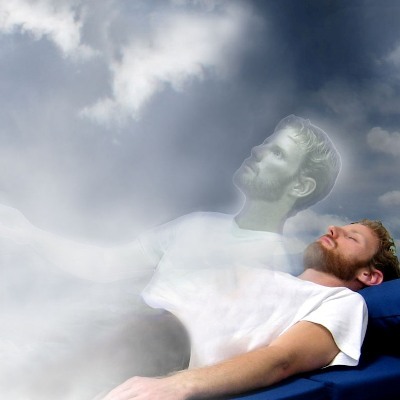 A near-death experience (NDE) is essentially an out-of-body experience, so it is possible to travel to these same places out of the body using exercises of astral projection (which obviously does not involve death or being near it). Almost everyone who starts exploring other dimensions through having out-of-body experiences is soon confronted with negative beings that try and thwart their attempts to wake up and see beyond the physical body. This is because people who are able to astral project in a serious and objective way are considered a real threat, as it is possible to use OBEs to truly uncover who and what these entities are beyond the limitations of physical perception. Myself, my husband, and many others I have spoken to, have encountered demonic entities whilst out of the body on countless occasions; and my husband has been able to explore them down to their root in the underworld, in the lower/infra-dimensions out of the body. In the astral plane, these creatures move around and are able to influence not only events in the physical world, but even people's own psychological state of being. I remember one occasion where I was with a group of people doing an exercise to astral project. We had cast a circle of light around us; when I came out of my body I saw a demonic figure looking in through the window of the room, unable to get into the circle, but chanting an evil invocation to try and thwart our attempts to leave our bodies. This figure was only visible from the astral, not the physical world, yet was nevertheless influencing all of us in the room by trying to muddy our consciousness with negative thoughts and energies. People who are trying to awaken in light can be shown information in dreams and out-of-body experiences about demons, how they influence society, and who they work with beyond what someone in the physical world could be able to see. But information from the astral is not just limited to demons - it can be about potentially anything. Astral projection and other spiritual practices, then, become a powerful and effective means to learn how to overcome evil when combined with a spiritual work. To the left is the Sith lord Sidious who turns the Jedi Anakin on the right to the "dark side". Notice the statues in the background both have their left arms over their right. This is used by demons (instead it is right over left for those of the light). It signifies the "left-handed path". So what are these entities? Are they human, animal, extraterrestrial or something else entirely? In my experience out of the body, these entities are either human or once were. And while this may sound far out, this concept is actually explored in a number of our own modern myths. "Going to the dark side" was popularized by the Star Wars films created by George Lucas, and this same concept appears in The Lord of the Rings trilogy by J.R.R. Tolkien. 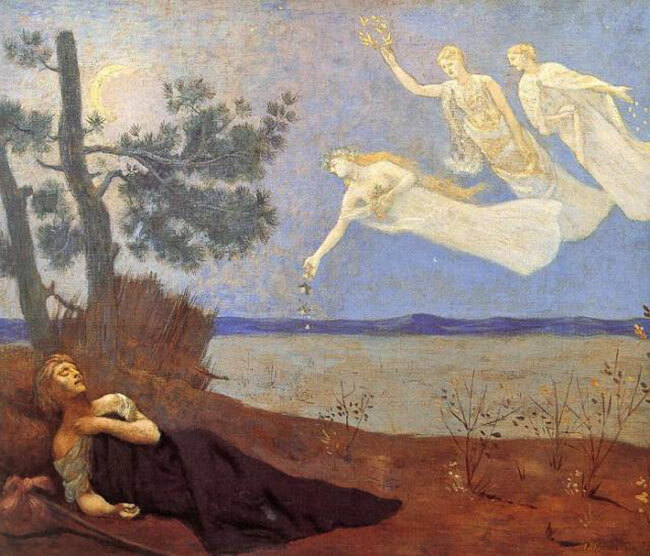 Both Lucas and Tolkien studied ancient myths and religions, and their depiction of the supernatural conflict between those who have awakened in light and those who have awakened in darkness, in many ways is quite accurate. 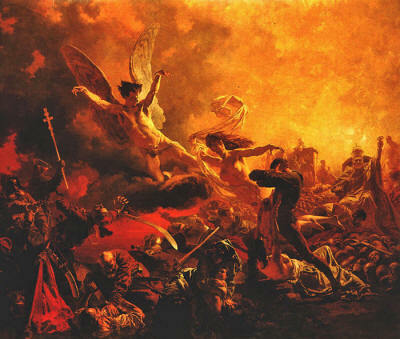 the war between "the sons of darkness" and "the sons of light". 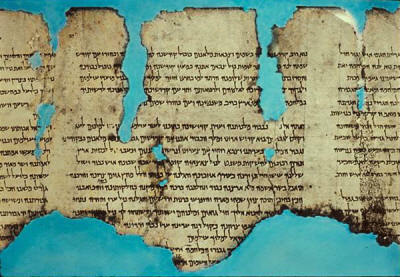 It is the same concept that appeared over 2,000 years ago in the famous ancient texts of the Essene community (which Jesus was said to have spent time with) called the Dead Sea Scrolls. 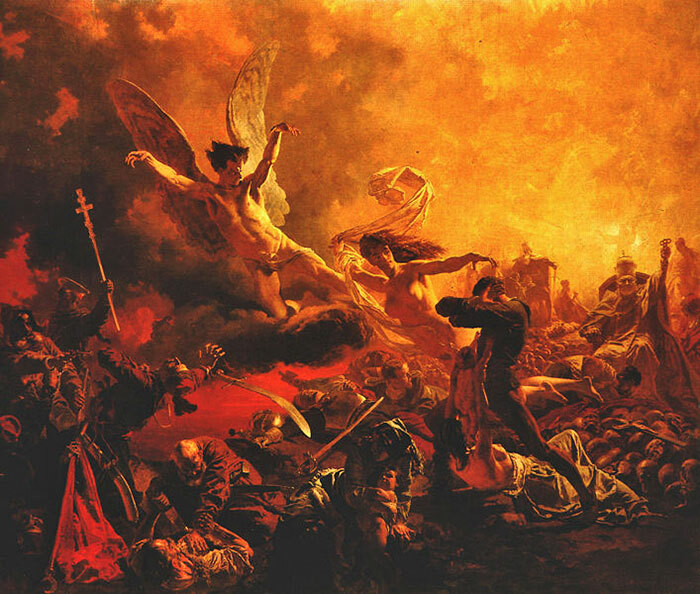 They wrote about a great war between the archangel Michael, his angelic hosts, and the sons of light, against the demon Belial, his hordes, and the sons of darkness. Today, this same concept has been popularized through movies to form the basis of some of the myths of our own modern society. In Star Wars the evil Sith use the dark side of "the force" (which is basically universal energy) for power and malice, whilst the Jedi use the force in line with love and cosmic principles. Likewise in The Lord of the Rings trilogy there are wizards of white magic like Gandalf who use their spiritual powers for good, whilst the wizard Saruman turns to the "dark side" and uses his powers for evil. are pitted against one another in a struggle of cosmic proportions. These individuals who have awakened esoteric abilities, both of light and of darkness, are pitted against one another in an eternal struggle, with each side wishing to either uphold the principles of a free society or to completely enslave it. 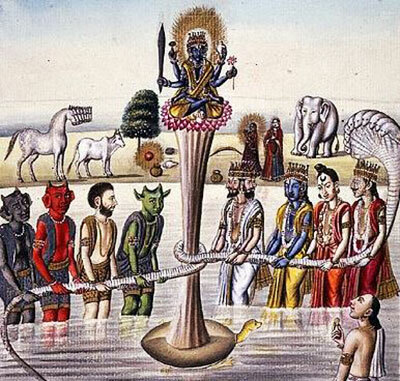 This was portrayed in the sacred teachings of the Hindus in the story of the Churning of the Milky Ocean in which the asuras (demons) and devas (angels) struggle against one another in a tug of war of cosmic proportions. Individuals can both "go to the dark side" as Anakin did, and also repent and return to the light like Darth Vader. 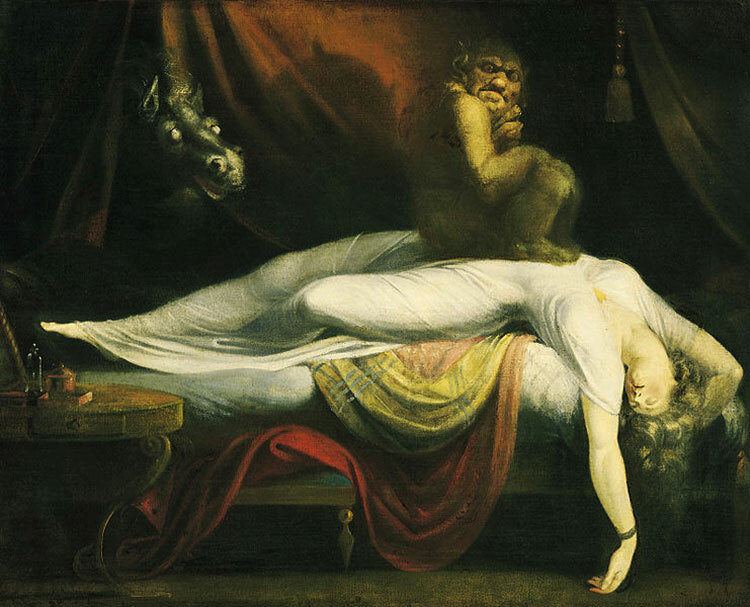 Demons can appear in the astral realm as human, or part creature, which reflects their hideous, bestial nature in which they have fortified the animalistic egos. But demons and black magicians are not silly monsters; they are people who have awakened in evil and this kind of awakening brings a knowledge of darkness, which can give them an intelligence and power beyond what any sci-fi movie could do justice to. As these films portray, these entities are humans or were once humanoids who have "gone to the dark side" and are working according to a hierarchy of evil to control and infiltrate society. 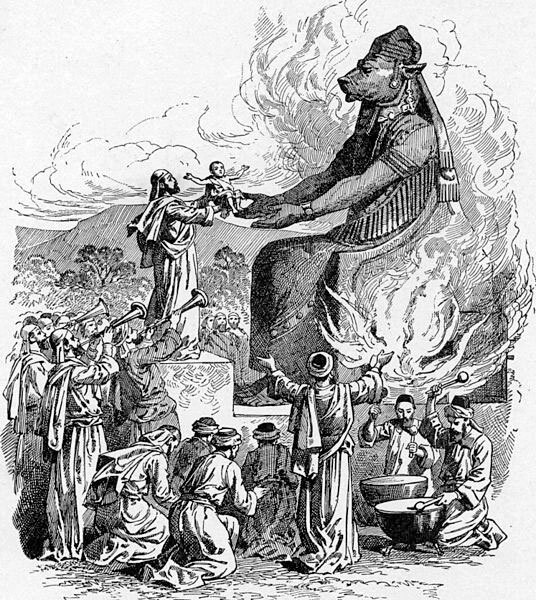 Child sacrifices being offered to an idol of the demon Moloch in ancient times. Many of the entities written about in ancient texts are references to ones that have specific roles and work together in a hierarchy of evil in other dimensions. Demons of antiquity have major roles and are still active today, thousands of years after they were first written about - no longer needing a physical body, having awakened in evil. They are part of a structure of evil that extends its tentacles right from the lowest region of hell into the physical world. My husband and I have been shown out of the body how they work through dark secret societies, which channel covertly through a religion, and are communicating with a very small group of people here on earth who are going through the process of awakening in darkness. These disciples of darkness are using OBEs to get knowledge from ancient demons who themselves are beyond physical death and working with an immense evil intelligence on an agenda which is thousands of years old. A key part of it is putting down and propagating hatred towards anything that gives knowledge about them and other realms of reality, such as sacred, esoteric, and religious texts - spreading lies, disinformation, division, and bigotry. They do not want another Jesus, Krishna, Quetzalcoatl, or anyone who awakens spiritually in light, nor spiritual societies that operate for good who could counter their influence, and they are on a stated mission to stamp them out in the documents of their plans which have leaked to the public, such as those of the Bavarian Illuminati. They hijack and invert spiritual symbols and even religions, taking symbols that attract forces of light to instead use them to give power to forces of darkness; and at the same time give esoteric knowledge a bad name. That is why so many inverted symbols are now literally pouring out of Hollywood and the music industry. It is important to note however, that all but a handful of people who are part of the agenda are simply in it for greed and money, forming the structure of puppet politicians and celebrities, shadow governments, criminal syndicates, and massive corporations that are manipulated by the very few at the top of the pyramid to control the many. They use human weakness and defects such as greed, ignorance, lust, and violence to entice, control and enslave their puppets, as well as the masses. 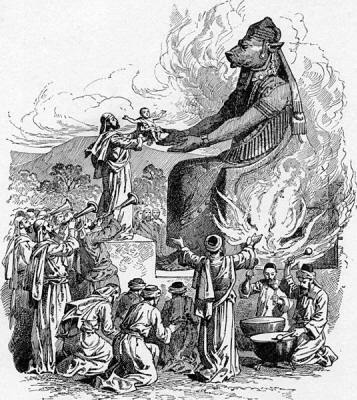 Just as the Sith were small in number in Star Wars, so are those working directly with these demonic entities as very few are actually up to it (Aleister Crowley tried and failed very publicly), because just as awakening in light requires discipline and adherence to certain practices, so too does awakening in darkness. The number of "Jedi" are even smaller. Instead most people are unknowing of multidimensional realities, they have no interest in really finding out what is going on, and their lives are simply determined by where the war between light and darkness is at. to enter realms beyond the physical. Making a decision about where we stand in this eternal struggle in which our own awakening is at stake. The only way the Jedi can return is if we put this struggle into its true context and allow the real warriors of light to do their job. Society has almost totally turned on esoteric knowledge and practitioners, and a tidal wave of censorship is set to wipe anything esoteric off the internet and strangle it on the ground. So long as the Jedi remain broken up and abandoned in exile to the far reaches of society (like Yoda in the swamp infested planet of Dagobah and Obi-Wan Kenobi as an old hermit on the planet Tatooine) there will be no happy ending. The world desperately needs people who can use OBEs to get knowledge about the inner workings and plans of evil, who meet the requirements to receive spiritual wisdom from higher beings, and have awakened spiritual/psychic faculties. Ultimately, the agenda of evil is about stopping people from awakening spiritually; not just in information, but in consciousness, as at the end of the day, that is really what life is all about. And ultimately, that is where the war is.